Recently, I made a plea to SEMA builders to try and build some cars where the usual huge V8 engines are replaced by tiny, anemic little engines of two or three cylinders, just out of some deep-seated perversion. It looks like that idea has sort of already started, as this Plymouth Roadrunner with a 3-cylinder two-stroke diesel demonstrates. Now, it’s not exactly like my idea because this Detroit Diesel 3-cylinder engine is not exactly a tiny little oil-chugging mouse. It’s a 2.6-liter beefy little brute making 101 HP and 205 lb-ft (146 Nrp) of torque. This is the sort of engine that’s used in equipment with real, tough, dirty jobs to do. 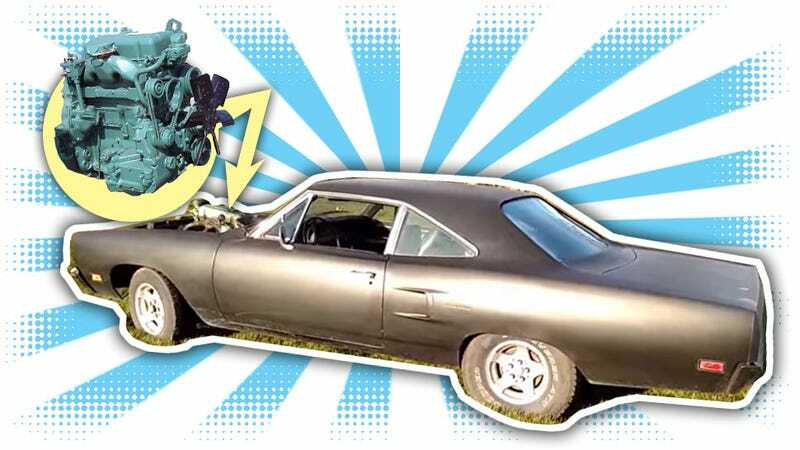 Even if it is a little more capable than I imagined for this sort of thing, it’s still delightfully wrong and perverse inside one of the most iconic muscle cars, a 1970 Plymouth Roadrunner. Keep in mind that thing came with a 383 (like 6.2-liters) V8 originally. The owner also runs this beast on a mix of used cooking oil and gasoline, and gets about 25 MPG. It’s wonderful.